A recent survey has shown that the biggest challenges faced by fire prevention organizations is budget and personnel retention. Money and people. More specifically, it would seem, lack of money to hire, train, and retain personnel needed to carry out fire prevention functions. NFPA 1730, Standard on Organization and Deployment of Fire Prevention Inspection and Code Enforcement, Plan Review, Investigation, and Public Education Operations, is a new standard that provides a method to determine, and justify, personnel and staffing needs. The stated purpose of the standard is "to specify the minimum criteria addressing the effectiveness and efficiency of the fire prevention organization". This standard outlines basic fire prevention functions, and how to determine services that should be offered. Annex C, of NFPA 1730, provides a 5 step system to determine minimum staffing levels needed for these functions and fire prevention services. Step 1: Outline all services provided by the fire prevention organization. Start the staff needs analysis process by listing all services provided, functions performed, and activities conducted. This should be an exhaustive and comprehensive list. The list should include all activities, no matter how many times they are performed or how much time they take. 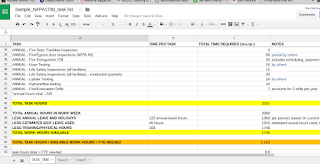 Step 2: Determine time demand for each task. Determine the amount of time it takes to complete each task, function, and activity listed in step 1, above. This should include all components such as, preparation time, scheduling, research, conducting the activity, report writing, and any follow-up. You will need to determine the time each of these take on an annual basis. Step 3: Determine total personnel hours required to complete activities. Add up the total amount of hours required for all tasks and activities. If your organization has many different tasks, programs, and functions, these can be divided into groups to simplify, or further analyze the total hours required. Step 4: Calculate personnel total availability. This formula will determine the amount of hours that each employee will have available. This must account for holidays, vacation, sick, training, and other times that the employee will not be available for work. Step 5: Calculate total number of personnel required to perform tasks. To determine the total amount of full-time employees that are needed to perform all fire prevention functions and tasks, divide the total task hours by the total available work hours. Fractional values can be rounded up or down. If the number is rounded up it can provide reserve capacity and provide some ‘cushion’. If the number is rounded down, this could result in overtime or increased workload for personnel.